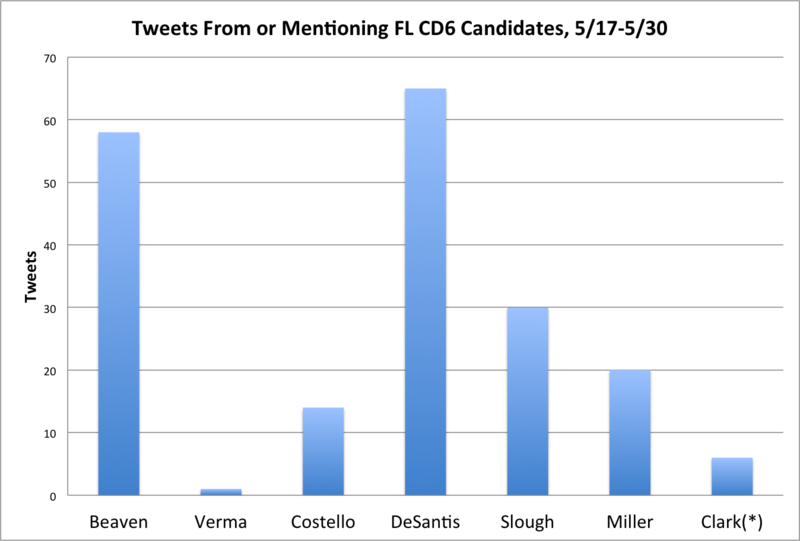 Heather Beaven and Ron DeSantis are way ahead of the others at this point. I just started tracking Richard Clark, so his numbers are incomplete — mid-June I’ll have a better sense of activity by and about him. 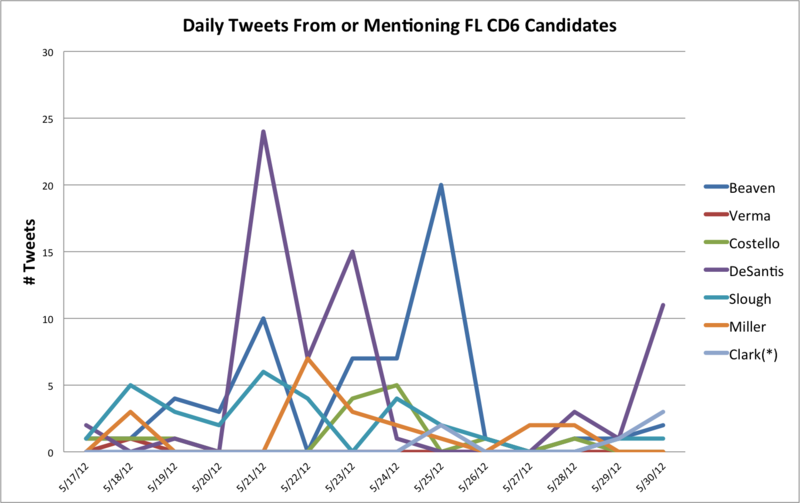 Nobody has a consistent drumbeat of activity at this point — it’s still running hot and cold for all the candidates. But if you compare this to a couple of weeks ago, you can see that the level of activity is starting to increase in general. Romney and Obama have been facing off against each other on Twitter for many months now as the GOP primaries have become irrelevant. It’s interesting to see what each candidate talks about. First and foremost, Obama’s making the case for why he should be re-elected in about a third of his tweets (discussing accomplishments,16% of tweets, and his vision, 19% of tweets). He’s discussing what he has done for the people of the country and what he will continue to do in a second term. About a quarter of his tweets are focused on trying to get people to participate in his campaign in some fashion, from something as quick as signing up on his web site to as serious as becoming a full time participant. He’s looking to build a massive organization and is recruiting via social media. Net net, Obama is spending his time and effort to explain to the people why he is the right choice in the election. 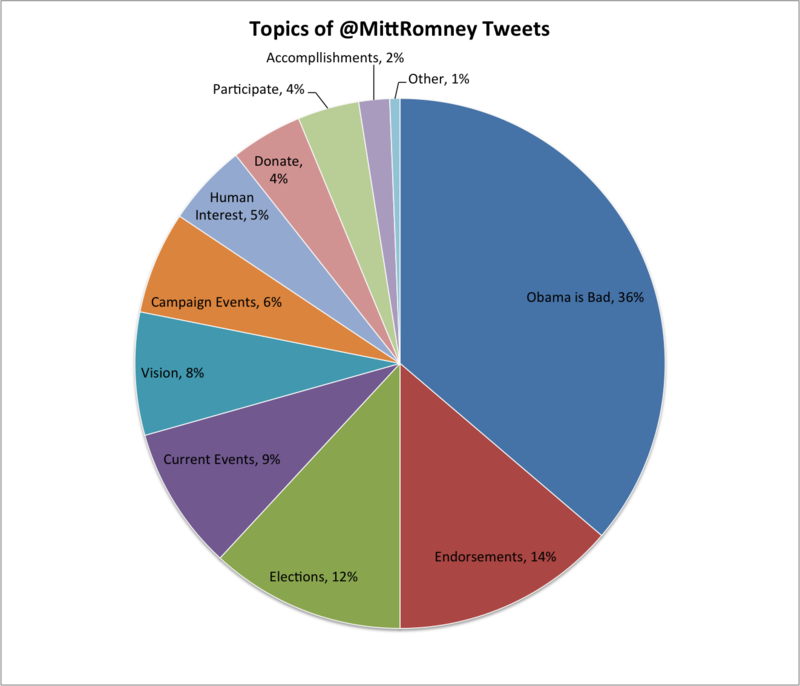 The largest chunk of Romney’s tweets, over a third, have been to criticize the President. Next is constant stream of “thank yous” to other politicians for endorsing him. Interestingly, if you combine tweets about his accomplishments and his vision for the future, it adds up to just under 10%. Thus, it is clear that Romney is spending his time and effort to explain why Obama is the wrong choice in the election. Mitt Romney hardly makes any effort to explain why he would be a better president, except constantly say that he is not Obama. So it seems safe to say there’s one thing they both agree upon: the key topic for the election is Obama. Did you know they’re tracking your every click? Do you know how and why they do it? The secret is the link. Fortunately, the answers to these mysteries are fairly straightforward. With mystery #1, as you no doubt suspect, the Obama campaign is using a custom URL shortener (for more details on URL shorteners, see this article). You’re probably familiar with more popular URL shorteners like bitly and TinyURL. The Obama campaign is using one of these services (see Asides at the end), but working with their own private domain, OFA.BO. 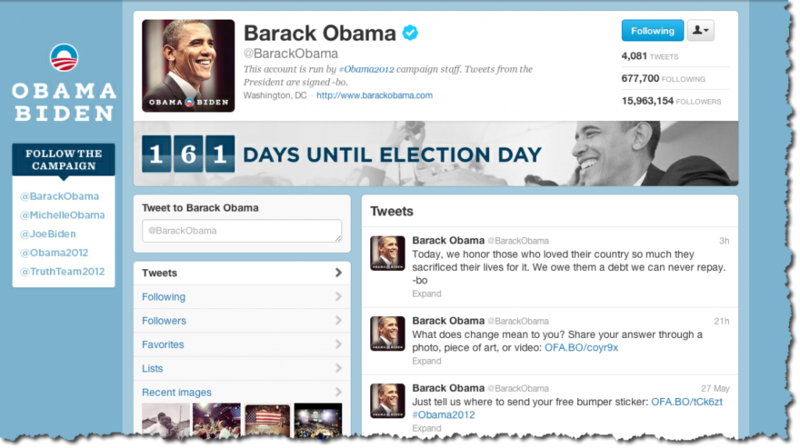 But while you were going through OFA.BO, your click is captured by the Obama campaign: they know which specific tweet caught your eye and got you to click on the video. Very tricky! The motivation for doing this is pretty simple. 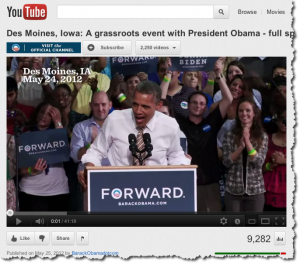 Like any marketer, the Obama campaign wants to know what works and what doesn’t. A tweet that gets very few clicks is a failure and won’t be repeated or imitated. But a tweet that gets an enormous amount of clicks is a success and will be used as a model for future tweets. This is especially useful for them when the campaign is trying to figure out how to phrase or explain something. That’s the solution to mystery #2, where the two similar tweets have different shortened URLs: the Obama campaign wants to know which of the two messages gets the the biggest reaction, and so it tracks each tweet by giving it a different URL. Is it the tweet focusing on Bain’s profit at the expense of jobs? Or is it the other focusing on what sounds like mismanagement? By the time you’re reading this, the Obama campaign has undoubtedly recorded enough clicks to know if either or both gets people fired up. The value of this analysis extends well beyond Twitter: as messages are tested on Twitter and the best phrasing discovered, the campaign knows better how to present Obama’s messages in person and in traditional media. 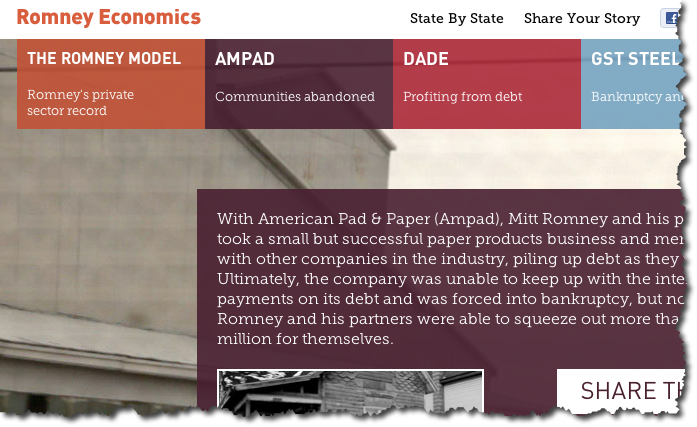 If you hear Obama speak on the subject, and he focuses on how much money Bain made from Ampad, you know the first one got all the clicks. You can almost imagine them using Twitter not for Twitter’s sake, but to research how to put an important speech together! Granted, there isn’t much difference between these two tweets, but Romney’s team has no way of knowing which of the two is more popular. You snooze, you lose… Politics, like football, can be a game of inches. Always use a URL shortener for links you post on Twitter (or Facebook). Make sure the link shortener has a convenient way of producing reports on people’s clicks. Try out different forms of your messages, and pay attention to which one(s) work the best. It’s more effort, but you’ll be rewarded with a better knowledge of what succeeds on Twitter (and perhaps beyond). We’re lucky that the tools to do this kind of tracking and testing are readily available to all of us, not just to well financed campaigns. You can use something as simple as Twitter’s free Tweetdeck to compose and schedule messages along with bitly to track responses (also for free), or move to an integrated application like Hootsuite which provides scheduling, link shortening, multiple social network management, and analytics all in one package. See the Resources section at the end for some suggested places to start. For some of you, this secret seems like it is just common sense. And if it does, I apologize. But I’m always amazed by the number of people who don’t use anything but the most primitive tools for using Twitter. As an example, in this analysis I did of what Twitter tools US Senators use, over 50% of their usage is via the web interface at Twitter’s homepage. As a result, they have no way of knowing whether people are responding to their tweets or not. And these are politicians with jobs of national importance — and who only keep their jobs if the public approves of them! They should know better. The learning curve for getting reports out of link shorteners is painless. Anyone whose tweets are in service of a larger goal has no excuse not to begin to use these tools in their social media activities. Give it a shot and see what you learn. When you do, you can feel proud that you’re using the same avant-garde techniques the President’s campaign team is using! Keep up to date with future updates to this series by following me on Twitter and/or subscribing to updates to this website. To see all posts in this series, visit the overview page. To move on to Secret #2, click here. Why have a private URL shortener like OFA.BO? One reason is just pure branding. But another reason comes when people re-tweet something from the campaign. No matter whose tweet(s) you look at, if the URL starts with OFA.BO, you know that the URL originated from the Obama campaign and is safe to click. If you see a bit.ly or any other link shortener’s URL, then you really don’t know — is it a link to real campaign content, or is it a link to a spam or phishing site? If you are a large company with a reputation to protect, you should probably invest in your own private URL shortener for the same reason. This cost is negligible. You can even use the same services Obama and Romney use! Twitter adds an extra wrinkle to the process of getting to your final URL, but it doesn’t fundamentally change the process. Twitter runs all URLs (even ones already shortened elsewhere) through their t.co link shortener, so your browser actually goes to t.co first. In the case of Obama’s links, t.co will return an ofa.bo URL to the browser. Then the browser goes to ofa.bo and retrieves the YouTube URL. Finally, the browser gets the YouTube page and you see the video. You still probably don’t notice the process of bouncing around, but it is going to be slower than going right to YouTube. The OFA.BO web site is managed by a company called ShortSwitch. MI.TT is managed by Bitly. OFA stands for “Obama For America”. .BO is the country domain for Bolivia. .TT (of MI.TT fame) is for Trinidad and Tobago. Remember the night of November 4th, 2008, when Senator Obama took stage in Grant Park to give his victory speech? The massive crowd that night that cried with joy? The Kennedyesque way the the young family walked out onto the platform? It all seemed like Camelot had returned. But do you also remember how unlikely it seemed, a year before, that the winner of that night would have been Barack Obama? How big the challenge, how high the hurdles he had to overcome to successfully take on the presumptive front runners in the primaries and general election? If you were an Obama supporter, you were ecstatic that he had run a nearly perfect campaign that narrowly defeated Clinton in the primaries and went on to win the general election. If you were a McCain supporter, on election night you were left to shake your head in disbelief and relive a combination of campaign mistakes and unfortunate timings that tanked that campaign. You could only wonder, in the end, what could the GOP campaign have done better and what did Obama do that McCain didn’t? Very shortly after the election, an answer emerged: Obama’s use of social media had given him a key advantage in the race (see notes). Whether this is really true or not is something political scientists may argue for decades. But at the time there was a kind of symbiotic hype curve that elevated both social media’s prowess and Obama’s mastery of the media. So how did Obama come to be such a social media maven? The path to building his 2008 social media juggernaut may have had its origins in a humble Facebook page the then Senator set up in 2006. It was at that point he met Chris Hughes, one of the founders of Facebook, who helped him get his fan page working. 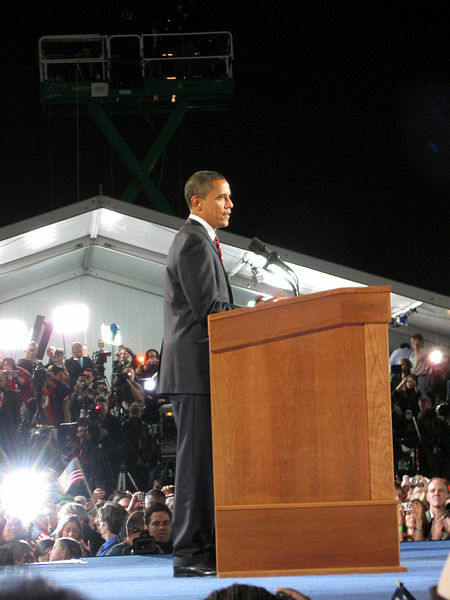 Shortly thereafter, around January 2007, Hughes quit Facebook to join the Obama campaign. Hughes brought a critical insight into the Facebook platform and social media in general. And the campaign did not rely on just Hughes alone: Obama had also hired Joe Rospars, who developed web expertise in Howard Dean’s 2004 campaign and had gone on to co-found Blue States Digital, an early new media agency. It was like a guy in a garage who was thinking of taking on the biggest names in the business … What he was doing shouldn’t have been possible, but we see a lot of that out here and then something clicks. Something did click for the Obama campaign! For many people — politicians, business leaders, and the public — the campaign’s victory was a first glimpse at how powerful social media could be. The Obama team innovated and learned on the fly and showed us, in the end, what could be done with the right tools. But the 2008 campaign did not teach the Obama team everything there is to know about social media — at least not everything they need to know about social media as it stands today. In 2008, Facebook, MySpace, text messaging, email and a custom web site were the core of the efforts. Back then, Twitter was just barely on the radar: @BarackObama had only about 120,000 followers. With Obama now having almost 16 million followers on Twitter, Twitter’s importance to the campaign is has grown exponentially to match the follower count; Twitter has moved from barely there to front and center. And so the Obama campaign is going to have to invent new ways to harness Twitter if it’s going to help Obama win reelection. If it does, people will point to his use of Twitter as groundbreaking. If Obama loses, though, his use of Twitter will be a lesson in missed opportunities and an opposition that’s caught up and caught on to social media. Make no mistake, the Obama campaign knows this and is aiming for groundbreaking by aggressively pursuing all uses of social media in this election cycle, including Twitter. The team this election includes some repeats from 2008 like Joe Rospars, who is back as Chief Digital Strategist, bringing along his Blue States Digital alum Teddy Goff as Digital Director. Perhaps more importantly, the campaign has built up an extensive new media and technology staff — large enough for any hot Silicon Valley startup. 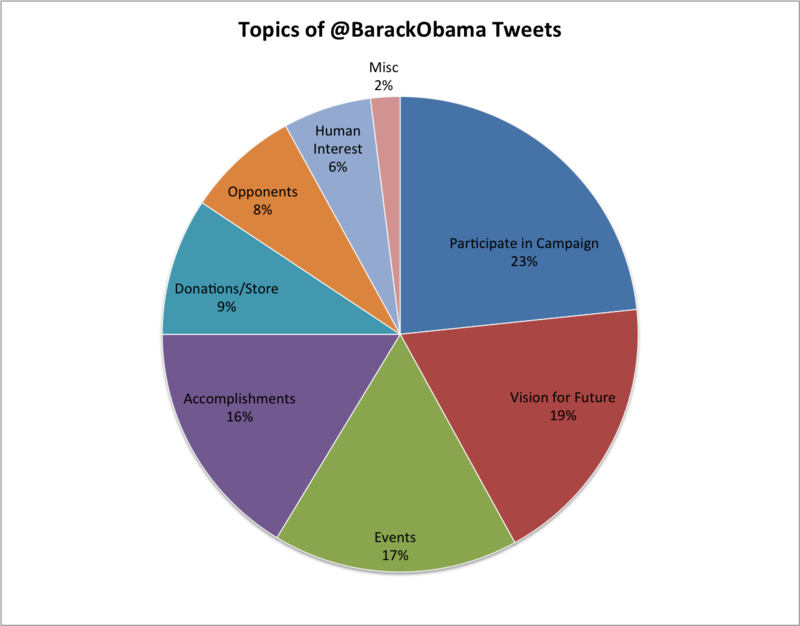 So far, it’s been working fairly well: Obama has been able to dominate the social conversation. As I wrote a short while ago, Obama’s engagement in Twitter dwarfs Romney’s, and Obama is generally ahead of Romney on other platforms (for example, on Facebook). Even if the GOP contender’s lag has been caused by the brutal primary season, Romney has a long way to go to catch up. True, we’ve seen battles break out over hashtags, kerfuffles over stay-at-home moms, and strange claims about who’s winning on Twitter. But the raw numbers don’t lie – Obama’s lead over Romney in social media is similar to Obama’s lead over McCain 4 years ago. That doesn’t bode well for Romney, but his campaign knows that. What has the Obama campaign done so far to build its lead? What are they doing now to maintain it? What might they do between now and the November election to extend it? These are all fascinating questions, not just for the political ramifications, but for what it teaches us about how social media can be used by other candidates, businesses, or people with any sort of message to get out. The answers to these questions are not out in the open while the campaign is underway. A few articles have appeared here and there that tease us about aspects of the digital campaign, giving us a glimpse into the campaign’s strategy. 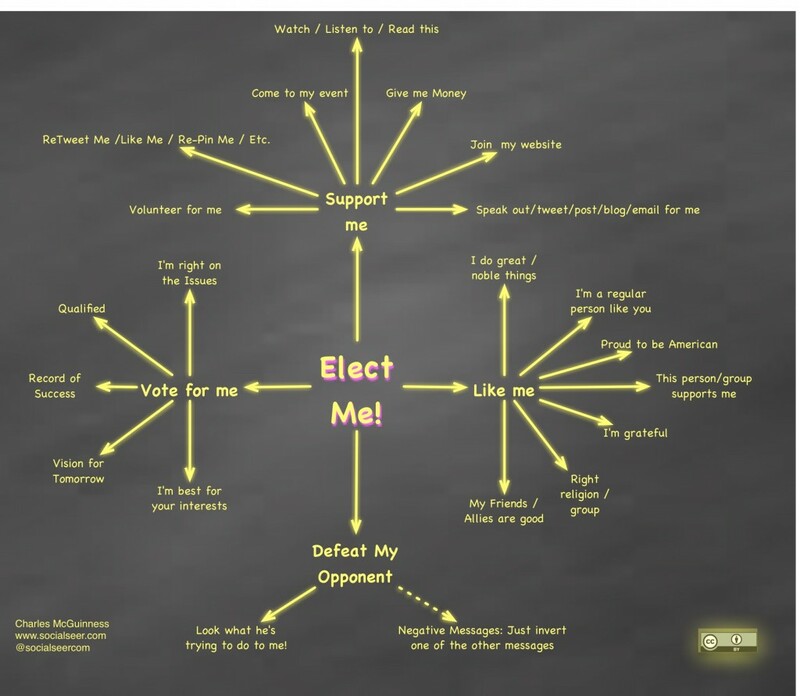 But now that the Obama team has shifted into high gear we can begin to investigate what the campaign is doing on Twitter and identify some of the tools and approaches they are using to win the social media battle. 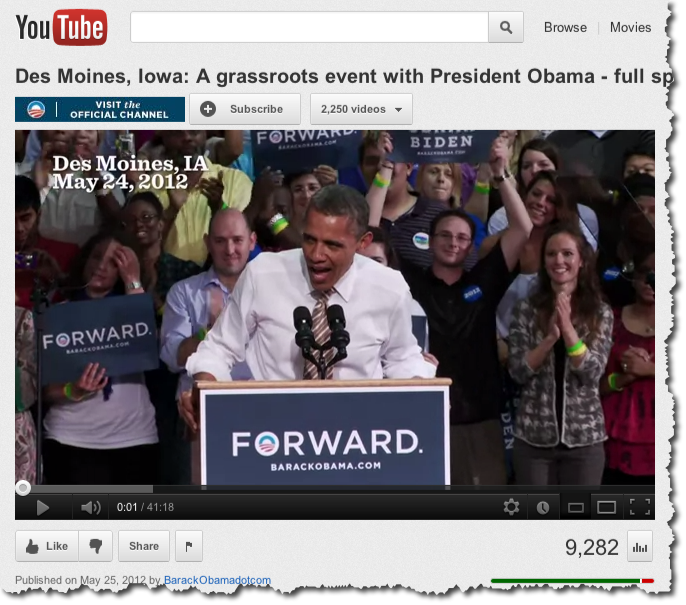 In subsequent posts in this series, I will look at the various forms of engagement the Obama campaign is using, explain how it works, and then discuss how others — candidates or businesses — can adopt similar techniques — even without a top notch social media team. There’s a lot to be learned for both neophytes and experienced pros. To stay tuned to the story, please follow me on Twitter and subscribe to updates to this website. Let’s start at Secret #1! And at any time you can see a list of all posts in this series by visiting the overview.